I always wonder if I was right or wrong and I guess my instincts were correct. What is he talking about ?? you’re saying just about now? Well eggs of course, I look at recipes that call for 5 large eggs but I have jumbo or medium no large to be found do I just use 5 eggs or do I make a judgment call and increase or decrease. Don’t get me going on sizes that’s a whole other story what they call large eggs nowadays I tell you….Anyway thanks to Cooks Illustrated I have been vindicated I was right to make adjustments see their chart below. 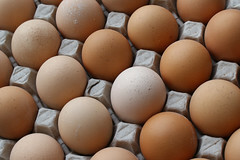 See 5 large eggs would be 4 Jumbo or 4 ½ Extra- Large. Does it make a difference in the end probably not at least not enough to ruin a dish. But then there is baking and you know I really don’t bake because it is too exact you have to measure everything out so is that the catch 22 baking and measuring eggs who knows? I know sometimes I just like to over think things keeps the mind boggled and sharp. So checks out the chart, officially eggs are really measured by weight not size. This entry was posted in Eggs and tagged Cook's Illustrated, eggs, Ounce, size. Bookmark the permalink.